Make your own bulky Crochet Cowl in no time at all. Need a new pattern to play with? 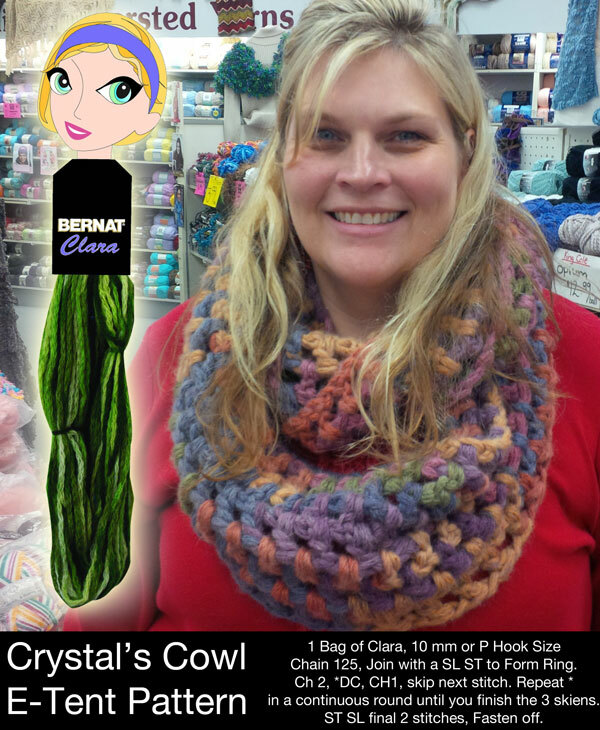 You could try Crystal’s Cowl. Crystal is the coordinator of the Spinrite Factory Outlet E-Tent. She personally picks all of the yarn and prepares it for shipping so that E-Tent Shoppers can get their new yarn purchases as fast as possible. Having personally met Crystal, I can tell you she is bubbly and a lot of fun. Clara is a discontinued product of Bernat. It is being sold by the bag with three yarn skeins per bag. For 3 skeins of this yarn, you would have paid nearly $30. The E-Tent Price is $7 per bag! That is less than the price of 1 skein by itself! You can find it, plus many other yarn selections in the new Spinrite Factory Outlet E-Tent Online Store. Chain 125. Join with SL ST to the beginning chain to form a ring. Ch 2, *DC, CH 1, Skip Next Stitch. Repeat * in a continuous round until all 3 skeins are used. Final 2 stitches of the cowl are SL ST. Fasten off and weave in the ends. It’s really that simple and is a great idea for keeping warm and fashionable this winter! For more inspiration and ideas, please visit Spinrite Factory Outlet’s Facebook Page to stay up to date with new releases of E-Tent Yarn and In Store Specials. This entry was posted in Scarves, Spinrite Factory Outlet and tagged Cowl, Craft, Crochet, crochet crowd, E-Tent, Free Crochet Pattern, Mikey, Spinrite Factory Outlet, Yarn. Bookmark the permalink. oh my that looks super cosy!